Dynamite Magazine Lot. See pictures. DYNAMITE Magazine #54 1978 Battlestar Galactica. Condition is Acceptable. Shipped with USPS First Class Package. Vintage Dynamite Magazine No.5 - 1974, Born free, with original inserts. Condition is Very Good. Shipped with USPS First Class Package. Vintage Dynamite Magazine No. 26 - Welcome to the San Diego Zoo. Condition is Acceptable. Shipped with USPS Media Mail. DYNAMITE MAGAZINE VOL 6 No 10 RICKY SCHRODER - SILVER SPOONS - INCLUDES IRON-ON! 6 No. 10 (107) RICKY SCHRODER - SILVER SPOONS APRIL. All original inserts are tight. The only signs of wear are from years of storage and small creases in top and bottom right and left hand corners on the cover and back pages. 32 page 8 1/2" X 11" Magazine. All in very good condition. Dynamite Magazine April 1979; 32 pages; cover Christopher Reeve and skater Lynn Holly Johnson. Dynamite Magazine #83 1981. FAMOUS MONSTERS cover. Greetings. Jan 1974 back issue of Dynamite magazine in very good overall condition. BATTLESTAR GALACTICA cover. Dynamite Magazine #54 1978. MISSING PICTURES INSIDE SEE PHOTO. Dynamite Magazine 1974 Volume Five Lions. Condition is Good. Shipped with USPS Media Mail. GILDA RADNER cover. Dynamite Magazine Vol 3 #9. Complete with inserts. For sale is a 1975 Dynamite Magazine featuring Little House on the Prairie. 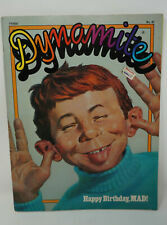 Listed is a vintage 1984 issue of Dynamite. It featured Mr. T. This issue is in very great condition with the cover being in almost new looking condition and the publication being clean from years, marks, and bent pages. The fold outs are no longer in this magazine. When you are done enjoying Dynamite, flip the magazine over to the back cover and enjoy reading Arcade- fun and games for the computer-age kid! This is a complete magazine. see pictures (Box 5). Dynamite Magazine #11 1975. LITTLE HOUSE ON THE PRAIRIE cover. SHAUN CASSIDY cover. Dynamite Magazine #77 1980. 1977 Dynamite magazine No. 40 featuring Farrah Fawcett, of Charlie's Angels on the cover. There's also a two-page story on her inside. SUPERMAN CHRISTOPHER REEVE & LYNN-HOLLY JOHNSON cover. Dynamite Magazine #77 1980. HOUDINI STORY. Dynamite Magazine #23 1976. “The Face” Magazines x 4: Eminem, Bjork, Strokes, Ms. Dynamite, Kylie, Marc Jacobs, Radiohead, Avalanches, Nicole Kidman, Ministry of Sound, JT Leroy, Destiny’s Child, Timo Maas, Roni Size and much much more. 4 Issues: October 2000, August 2001, November 2001, and January 2002. Used Condition is Very Good. Shipped with USPS First Class Package. All auctions US only. Sales tax per eBay policy and your state laws may apply. It is in decent condition, has wear and minor staining to the cover. In good condition, no writing in magazine. Minor wear on spine, staples still intact. All inserts still intact in magazine. Dynamite Magazine 1979 Steve Martin Cover Vol 3 No 6 Rare Vintage Issue Good overall condition. See pictures for details of cover or ask any questions. Thanks for looking. The pages are yellowed with age. Condition is as seen in the photos. The Dynamite Checkers insert was never removed and included with this magazine. This magazine has no stains or odors. dynamite magazine kate jackson & Farrah Fawcett 2 Books In Lot. Condition is Very Good. Shipped with USPS Media Mail.